BUY DIGITAL COPY / CD: from Bandcamp. BUY CD: direct from Genin Records. THUMPERMONKEY LIVES! – We Bake Our Bread Beneath Her Holy Fire (Genin/Tooting Bizarre) – In which an unnoticed Sarf London band, twinkling away doing their good and frankly slightly odd stuff down there in the badlands explodes into an outrageous supernova, outshining half the sky. This album, these six epic songs, have ideas way beyond their station: huge depth, big sound, immaculate arrangements, and a big, big voice. It’s a lot of things, and greater than the sum of its parts: unashamed proper prog, lifted, by an avant sensibility, out of cheesy traps, yet swapping the harsher elements of experimental and avant rock for something more melodic, for refined guitars and real singing. Main man Michael Woodman’s downright classy voice is like a polished Peter Hammill, all power and in tune and spot-on vibrato. That fine voice is delivering twisted, complex melodies and equally twisted, happily ambiguous lyrics, the combination is thrilling. 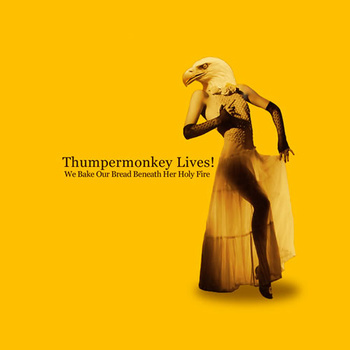 There’s nothing quite like Thumpermonkey Lives! but I can guess where they’re coming from: they’re the English Sleepytime Gorilla Museum, a more experimental Van Der Graaf Generator, they’ve got some of the headbending melodies of Time Of Orchids. They’ve been threatening this for a while, with a great debut album and much time spent hothousing their talents in their Immersion Composition Society lodge (you what? Go on, Google it, I dare you) – but We Bake Our Bread Beneath Her Holy Fire is still a surprise – a classic, even. Stuffed to the gills with possibly unconscious references to good things – hints of Yes, moments of Cardiacs-like odd sounds, loads of Gentle Giant – crikey. Throw in some Alex Harvey and Bowie and The Associates and Bobby Conn, a touch of Melvins if you like. It’s challenging only in that the melodies are thick on the ground and take you off in many directions, but that the complex mathyness underlying much of the songs is made easier on the ear by Woodman’s voice and the warm, clarity of the arrangements. I can see both followers of hard-boiled avant-rock and fans of more traditional prog bands like Porcupine Tree getting this, and if Thumpermonkey Lives! ahem, live a bit longer, the big prog festival organisers could well be beating a path to their door. It’s a shame to pigeonhole them, though – this is just compelling stuff, complete with lyrics to dig into (I love the demented Vivian Stanshall-ish storyline of Proctor Cylex, the Grendel-like menace of Whateley) and for Woodman to wrap his voice around. It doesn’t matter that they sound a bit like some of the more obscure prog bands like Tamarisk, Citizen Cain or England, they’re better at it; stranger and more ambitious musically than anything within the limits of that old prog rock scene. I can imagine Thumpermonkey Lives! as they go about their lonely compulsion, like so many of the bands I love and namedrop: playing those gigs sandwiched between the local Oasis and the local Kasabian, some pub in the greasy perenieum between Croydon and Clapham or the Midlands or maybe Stateside equivalent. There’s a couple of lunatics down the front who’ve hitched for eight hours to see them, and behind them the unmoving, unblinking rows, pints tilting, jaws thunking en mass on the floor. Their ears tell them that here in this grotty room is a band as remarkable as any that ever walked the planet, playing just for them: most of them won’t believe it. Out of that audience one or maybe two will offer the hitcher lunatics a ride to tomorrow’s gig, maybe the whole tour. The son of the headline band’s drummer will write their name on his school rucksack, and his friends will sing the lyrics next time, and let it be known that this doesn’t happen to those bands that sound like Kasabian.